Privacy Ultimate Underlay™ is a perfect solution for any floated, glued down or nailed down wood floor. Made from 97% post-consumer recycled rubber, it is not just a "green product," but comes with LEED certification from the US Green Building Council. Our Underlay will allow you the beauty and contemporary look of wood floors throughout your project without sacrificing sound privacy. For wood floors Privacy Ultimate Underlay cannot be matched. 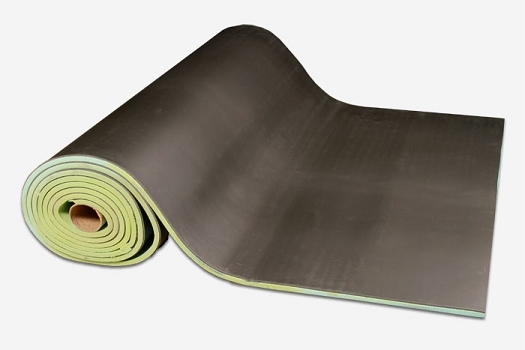 Our quality underlays are heavy enough to provide High Impact Isolation (IIC) as well as High Sound Transmission Blocking (STC) to effectively block both foot-fall noise, the most common noise issue with hardwood floors, and airborne noise also. Blocking both types of noise ensures the most privacy. Underlay comes in easy to handle rolls that are 48" wide. For floated wood floors or laminate the product is simply rolled out, the seams are taped, and you install the floated wood floor directly over our product immediately. For glue down floors our product must also be glued down; a very simple process outlined in our installation guide. If needed for residential projects we can shorten the rolls and weight. In most cases we ship this product by truck. Delivery to residential addresses is not a problem, we can include a power lift to set the pallets on the ground and you can move the material with a furniture dolly. Floated Floors on Concrete (3.2mm)Our thinnest underlay (1/8" or 3.2mm) is a first choice for soundproofing floated floors on concrete. Buildings constructed from concrete generally do not need a heavy product to correct footstep noise. Our Privacy Ultimate Underlay™ in 1/8" thickness is just right for these projects. Floated Floors on Lightweight Concrete (6mm)A mid-level thickness of underlay, our 1/4" (6mm) Privacy Ultimate Underlay™ is good choice for floated floors on lightweight concrete. In situations where the floor is already somewhat heavy, the ability to block airborne noise from up and down is greatly improved. When installing a wood floor over the lightweight concrete use a 1/8" underlay to provide reasonable footstep improve, and 1/4" underlay for the best outcome. Floated Floors Woodframe Construction (9mm)Noise passing through a simple woodframe floor can be a challenge to block and requires a substantial underlay to achieve desired results. Our 3/8" (9mm) Privacy Ultimate Underlay™ makes an excellent choice for soundproofing floated floors on a woodframe.